Valley of Fire State Park pleasantly surprised us with shockingly red colors and interesting rock formation. 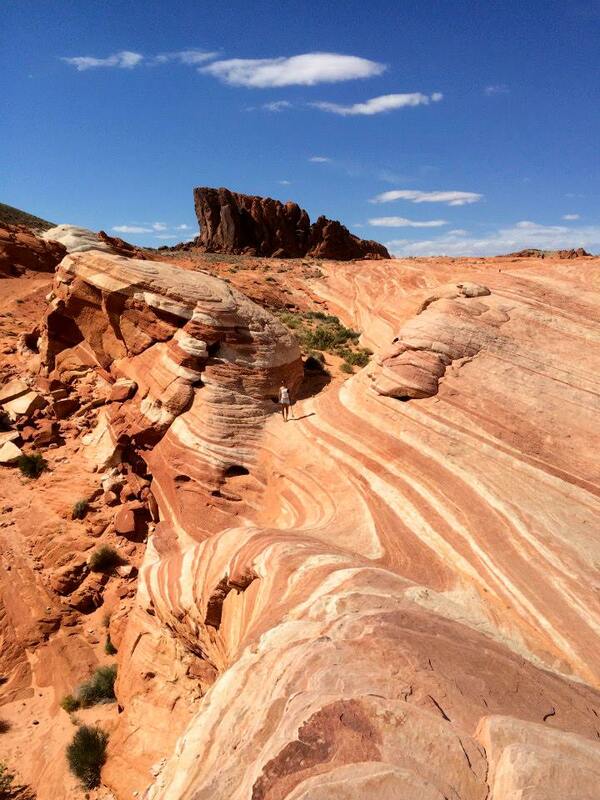 Initially beginning as a pit stop during our road trip, our hike to the fire wave in Valley of Fire turned out to be one our favorites, and we would definitely return to explore more. We parked in the last spot of the dirt parking lot and crossed the street to the trailhead marked by a metal sign. The trail was marked by easy to follow metal posts and didn't have much elevation change. Although it was April, the sun was intense on the exposed trail, and I would not recommend hiking this trail in the summer. After a short stretch on the soft sand, we transitioned onto red slickrock. Since it felt like we had gone more than 0.75 miles, we were unsure if we passed the wave since we heard it was difficult to spot. As we continued following the ribbons of red and white in the rock up and over a ridge, eventually we saw the rock smooth out beneath us and to the right. Although we saw the posts continue on and past the wave, we turned around and headed back to the car. We were glad we did this hike since the next day we were unsuccessful in the Wave (Paria canyon) lottery , but we still got to see our own mini version of the wave.